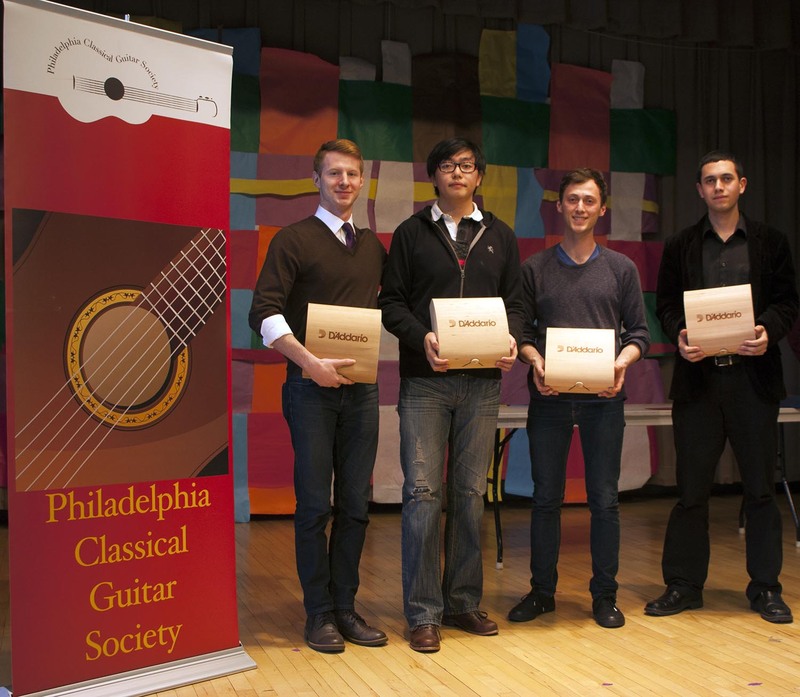 The 2015 Philadelphia Classical Guitar Competition included High School and Adult Divisions and included competitors from around the world. Awards included the $1000 Peter Segal prize for the first place Adult Division winner and additional prizes and performance opportunities for winners in separate Adult and High School divisions. For the 2015 competition students submitted their applications along with recordings of required repertoire. Finalists were selected after performing in the semifinal round on April 11, 2015. The finalists then performed on April 12, 2015 and were judged by the prestigious judges William Kanengiser (Los Angeles Guitar Quartet), Glen Caluda (Shenandoah University), Elizabeth Caluda (Shenandoah University), Marisol Rampolla (Community College of Philadelphia), Manena Contreras (Venezuela). Currently a student at Curtis Institute of Music, Mr. Holcomb studies with Grammy Award winning guitarists Jason Vieaux and David Starobin. Mr. Holcomb is a native of Nashville, TN. Currently a student at Curtis Institute of Music, Mr. Pu studies with Grammy Award winning guitarists Jason Vieaux and David Starobin. Mr. Pu is a native of Beijing, China. A professor of guitar at Rider University Mr. Freedman received his bachelor’s degree at Guilford College under guitarist Kami Rowan and his master’s degree at the University of Southern California under guitarists William Kanengiser and Scott Tennant. Mr. Freedman is a native of Brooklyn, NY. Currently a student at Rowan University, Mr. Bedoya studies with guitarist Kathleen Mayes. Mr. Bedoya is a native of Egg Harbor Township, NJ. Currently a student at Tenafly High School, Mr. Lauring studies with guitarist Seth Himmelhoch. Currently a student at Tenafly High School, Mr. Choe studies with guitarist Seth Himmelhoch. Currently a student at Haddon Township High School, Mr. Constans studies with guitarist Kathleen Mayes.